When you think of parasitic plants, you might imagine heavy clumps of mistletoe hanging from trees or tangles of yellow, spaghetti-like dodder smothering shrubs. Yet some of our loveliest wildflowers are parasites. Ratany (Krameria species) along with Indian paintbrush and owl clover (Castilleja species) are beautiful flowers and also hemiparasites—partial parasites that can photosynthesize and need only water from their hosts. The broomrape (Orobanche species), an unusual beauty, is a holoparasite, a full parasite that lacks chlorophyll and attaches to the roots of its host to take both food and water. While some of these parasitic plants aren’t very particular about their hosts, most species in the genus Orobanche have definite preferences for their host plants. Our desert broomrape, Orobanche cooperi, tends to attach itself to members of the Asteraceae, or sunflower family. The broomrape’s seed is stimulated to germinate when near the roots of its preferred host. After attaching to the host plant’s roots, it begins to form a bulbous base that remains hidden underground until the flower stalk emerges. The emerging plant will not be green, as it lacks chlorophyll, but will range in color from yellowish-brown to orange, red, blue, or purple. 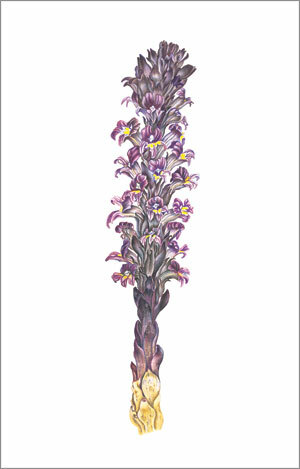 Margaret Pope’s illustration of Orobanche cooperi was prepared for the Arizona Native Plant Society’s poster, “Sonoran Desert Wildflowers”. Because the broomrape isn’t a commonly noticed wildflower, the society asked members to contact Margaret if they knew of a plant that she could use for reference. Luckily, a member in the Catalina Foothills had one growing at her home in an undisturbed area under a palo verde tree. Margaret’s drawing shows the portion of the plant that would appear above ground. This inflorescence is covered with dark violet scale-like leaves and a dense array of yellow-throated tubular flowers. 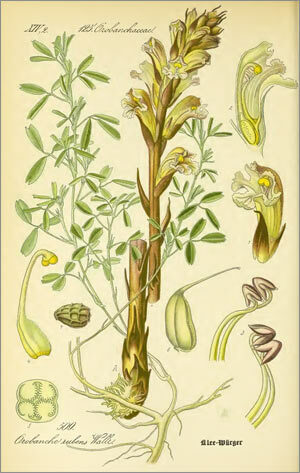 The second illustration is of Orobanche lutea (syn. Orobanche rubens) from Flowers of Germany, Austria and Switzerland (1885) by Otto Wilhelm Thomé. The artist shows the flower stalk and reproductive parts of the flower and also reveals the underground tuber attached to the roots of a clover plant. This appeared in the March 2016 issue of The Desert Breeze, the monthly newsletter of the Tucson Cactus and Succulent Society.